Though being a football agnostic, I have noticed that the European Championship in France will be special for Switzerland and Albania: Quite some of the players in the Swiss team are from Kosovo-Albania and so are some in the Albanian team – all of them trained in Switzerland. When the two teams play against each other, they might talk in Swiss German. This has been commented by the “Schnitzelbängg”. “Schnitzelbängg” belong to the Basel carnival (“Fasnacht”) that was celebrated in mid February this year: For three days my town was focused on nothing else but their Fasnacht. There is a lot to say (and love) about the “Basler Fasnacht”: The Morgestraich, the Cortège, the Guggekonzärt, the carpets of Räppli… and there are also the “Schnitzelbängg”. “Schnitzelbängg” are a kind of minstrels forming small groups that walk from one restaurant to the next in the evenings, presenting (mostly singing) short verses about what has happened during the year – in Basel, in Switzerland and in the world. This year they also commented about the match Switzerland – Albania in the European Championship. Here I am citing some verses, also trying to translate them into English and adding the links to the presentations of the “Käller-Assle” (the cheerful group of “cellar woodlouses”), the “Tam Tam” (The Tam Tam in their beautiful yellow trousers illustrate their verses with requisites they pull out of their large pockets – they won an award for their performance) and the Bataillioons-Glunggi (explanations below). Zwai Team, wo mit’nand Mundart rede. When Albania will play against Switzerland. Für d’EM z’Frankrych wird my Schtube zum Fussballstadion. Drei Match am Daag uff der Kautsch, das bruucht Kondition. My Frau schleppt’s Bier, pro Schpyl e Gatter. Voll yne, uuse läär. Numme Schwyz – Albanie lueg y nit. Do waisch nit, wär isch wär. During the EM in France my living room will become a football stadium. Three matches a day on the sofa, that will require physical shape. My wife will carry the beer, per match a sixpack. Coming full and going empty. Only Switzerland – Albania I will not watch. Because we will not know, who is who. Mir hän ufem Wääg in Dienscht im Zuug die Faane gschwänggt. Dr Ueli Muurer froggt uns, was das soll was hän der eych do dänggt. Drbyy hän mir nur welle d’Schwizernazi understyytze. The Albanian flag is the black eagle with two heads on red. 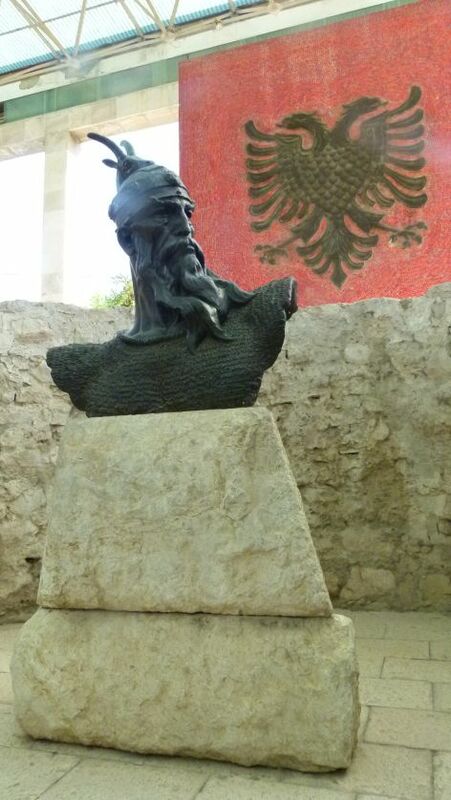 Here it is with the bust of Skanderbeg in Lezha (Albania). Well, may be – even as a football agnostic – I will watch the match Switzerland – Albania, but then I will not know which team to support. This entry was posted in Albania.